This is a review of the TI-36X Pro Calculator by Texas Instruments. Originally, this was the TI-30X Pro that was sold in Europe during the Autumn of 2010. Unfortunately, the 30X Pro had many bugs and as a result Texas Instruments quickly pulled the calculator off the market. Click on this link for an article on the TI30X_Pro . The datamath.org website, which has this article, is maintained and run by Joerg Woerner, is an excellent site for Texas Instruments calculators, past and present. Recently, Texas Instruments released the TI-36X Pro, based on the TI-30X Pro; thankfully without the bugs. I got this calculator on 4/25/2011 at an Office Depot store in West Covina, California (greater Los Angeles area). The TI-36X Pro is Texas Instruments answer to Casio's fx-115 ES and Sharp's EL-W516 calculators. The calculator is dual powered - solar for operation and battery for memory retention. The 36X-Pro is designed to allow user to enter expressions exactly the way they are normally written. Exponents have a superscript, fraction bars can contain expressions, and answers can be shown in fraction form, decimal form, and if applicable, radical form or coefficients of π. The 36X-Pro welcomes a return of the definite integral, something that has been missing on TI non-graphing calculators since the TI-68 (we are talking the late 1980s). In addition, the 36X-Pro adds the numerical derivative, sums (Σ), and products (Π). The variable button works the same way, cycling through eight variables (an ALPHA key would SO much better). Thankfully, all the calculus functions require that x be the dummy variable, requiring only one press of the variable button. Sadly the percent function still doesn't "work". All it does is divide the number attached to the % by 100. Hence typing 21.99 + 9.75% returns 22.0875, not 24.134025 (what it should be). The 36X-Pro is function rich: prime factorization, fraction and integer extraction, absolute value, polar to rectangular conversions and vice versa, modulus, basic matrix operations, basic vector operations, base n conversions, logic functions, and random numbers. For statistical regressions, you are not limited to linear. Quadratic, Cubic, Logarithmic, Power, and Exponential are available. A trend that I am also seeing in non-graphing scientific (and financial) calculators is that distribution calculations are offered. For the 36X-Pro, this includes the Normal distribution and inverse (from a lower tail area), and discrete distributions Poisson and Binomial. The numeric solver on the 36X-Pro works pretty quickly for most equations. You do not have to set each equation equal to zero, the calculator allows you to enter the equation as is. You also get 2 and 3 systems of equations. A cool feature of the simultaneous solver is that if the calculator will let you know if the system has no solutions or infinite solutions For the 3x3 case, equations for which solutions cam be found. Example: x = -168/11 + 12z, y = 72/11 - 4z, z = z. The polynomial solver works with quadratic and cubic equations. The 36X-Pro has one OP function that you can store simple macros. The macro takes one number as input. You can store the final result (only the final result) into a variable. The OP is good for quick functions and one-step recurrence relations. It won't do multiple step functions, loops, or comparisons. Examples of macros include "*2+3" and "+x→x". There is also an expr-eval (evaluate expression) function that you can temporarily store an expression with variables, including calculus functions (x is the dummy variable). Be aware that the evaluation function works one time. There is also a table mode, but the expression is in terms of x, so the table feature is not good for sums (Σ), integrals, or derivatives. As far as complex number calculations are concerned, you are limited to arithmetic, square, cube, reciprocal, absolute value, angle, real and imaginary part extraction. The nice thing is that you can evaluate more complex functions with complex numbers...if you know the formulas. * This is the most advanced non-programmable Texas Instruments scientific calculator since the TI-68, and it's solar! * The operation is integrated: you do not have to switch to a separate matrix mode, complex mode, vector mode etc, to take advantage of these functions. This is my one big gripe about the Casio fx-115ES. * Only one key to access eight variables. To get the variable a, you have to press the variable key FIVE times. Yikes! TI was better off making an Alpha key and assign an alphabetical variable (and possibly θ) to each key. * The arithmetic keys are chrome on silver - if it were not for the etchings, I would not be able to see the arithmetic symbols. * Limited complex number functions. However, it is common that complex number functions on a calculator are usually limited. I say yes. The 36X-Pro is a nice calculator and well designed. I say it is comparable to the Casio fx-115ES and Sharp EL-W506 both in terms of speed and overall functionality. For the time being, the 36X-Pro is offered in select stores, but I suspect that within a few months this calculator will be everywhere competing with the fx-115ES for shelf space in stores everywhere. I paid $21.99 for it. * A detailed and sturdy pocket manual. You can download the manual online from TI's website. Here's an important note: This calculator is allowable on the NCEES exams, such as the Fundamentals of Surveying or Engineering. It now appears to be, by far, the best TI calculator for these exams. Good to know, Ben. This is one of the best non-graphing calculators TI has produced. Ditto on the poor % performance. "typing 21.99 + 9.75% returns 22.0875, not 24.134025 (what it should be)." To do this, you type [ 21.99 * 109.75% ]. Don't blame the calculator because you don't understand proper syntax. In what world is [ 21.99 + 9.75% ] correct in any way? I agree that the % doesn't work as one would expect. But then again it needs to be better defined just what exactly is expected to calculate the percentage against. For example: if you do 10 + 20 + 5%, what will be the 5% to which you want to add? And if you do 5% + 20? And 5% + 10 + 20? And 10 + 5% + 20? Is the % operator meant to be "the percentage of the number immediately to the left of this"? Good question jmnbastista. The % key really wasn't thought out when TI switched to the EOS (equation entry) interface from the AOS (one-line old-school interface). If I recall correctly, Casio "sort of" has a definition for the % key. For example, the x key, % key, + key sequence adds x% to the displayed total. The old TI-55s and the TI-36X both have a x<->y key, allowing you to swap registers. I looked over the TI-36X Pro manual but couldn't find a reference to that function. Does the TI-36X Pro have that function somewhere in it? Actually, one of the features I like about this calculator is that you can use the arrow keys in the middle of a calculation to grab values from previous calculations and input them into the current one. It's more intuitive and easier to keep track of than switching registers. I rarely use the variables memory because of this feature. I don't believe the 36X Pro has the exchange memory function (x<>y). About the % problem: just type "21.99 * 109.75%". IMO, 21.99 + 9.75% to produce the same result might be useful, but rather hacky. Its a funktion you'd have to know it existed, and would cause errors if you don't. A "x<>y" key would cause similar problems. Previous models had two well defined registers (left- and righthand) that were used by each operation. Since the 36X Pro allows more complex expressions, there is no intuitive way to define which operands should be switched. However, I do miss the Algebraic Operating System (AOS) used in previous models. In addition to the "x<>y" key, they allowed RPN like usage of operands like x^2 or sin(x), which required less key strokes. But at least we get a command history now, IMO one of the biggest advantage of non-RPN calculators. The work around to the % problem as I have thought out is the way we express %. Because there is no association of % key with the value....what it does is 9.75% is taken 9.75 per cent.....exactly as the definition of %. But to do the operation as 9.75% of 21.99, this is how it is to be done.....21.99*9.75%+21.99, this will return the value as 24.134025. Also we need to remember that % is mostly commercial function.....So when algorithms are wrtitten for scientific calculators, the mind sets are diff. and so they would try to duplicate the way scientific functions are written / evaluated......Just my thoughts....Not carved in stone.....and so I don't think the % key is not working, I would rather think that we need to understand how that particular function is desgined in the system. The 36X-Pro is a nice calculator and well designed. I say it is comparable to the Casio fx-115ES and Sharp EL-W506 both in terms of speed and overall functionality. Thanks for your excellent review! If I could please ask you a quick question and not take up too much of your time, I wonder what non-graphing calculator you would recommend purchasing if you could only purchase one - the Casio FX-115ES, the TI-36X Pro, and the Sharp EL-506X? Kindest thanks! I think because the fx-115ES had the better keyboard and it has a larger constant/conversion library. However, all three calculators are close - so you really can't go wrong with any of them. But, Eddie, the Casio loses all of your work when it times-out and powers-off; a complete failure in an advanced scientific calculator; the TI retains your work. Or a fourth option? Thanks again in advance! Cannon F-792SGA would definitely qualify as a fourth option. This is the best calculator you can get for the FE exam! 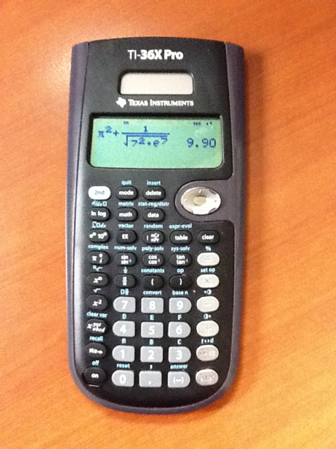 It is a solid non graphing calculator TI has released, virtually a TI 84 without the graphing or programming. How are you today? I was just wondering if you could please give us an example of how to use the "Logic function" on this calculator, I am trying to follow the manual but I still can't understand in which situations this could be useful. Fascinating how the logic operators work on this calculator. I hope this helps. Saying the percent key dosent work is not quite correct. A lot of calculator functions work the way they would as the mechanical machines they were meant to replace. I knew this from collecting and using slide rules. I recently got a hold of a remington adding machine and here is how you do percents. Now apply the percent turning the 1200 to 12.
and thats how ti intends it to be used. The TI calculator is a good bit faster than the Casio (about 2-3 times in my experience with big integrals), and has a lot more memory which doesn't get erased when you change modes. The function table is much better and TI's statistics editor allows you to enter formulas, so you can build a function table with that, too. The statistics variables can be viewed all at once. With TI you don't have to worry about "modes", so you can do integrals with the stat variables or solutions to equations, and you can type an integral or a hex or binary number into the statistics table. TI's conversions and constants are menu-based, so you don't need to refer to the little card. The TI is a little clunky with some things, like DMS or polar coordinates, but overall I like it much better than the Casio. I agree. In general TI calculators have a better interface and mode integration than Casio calculators. I tend to prefer using TI over Casio because of this. It makes a difference not having to switch modes. In India, the TI 36x pro is available at the same price as the Casio 991ES. I have ordered the TI. I've heard of a memory overload bug of the TI which gives wrong answers. Can you please tell me how to get around the bug? My main focus is matrix and someone told me that this one has more matrix functions for matrices. Can you please confirm that? Your blogs have been very helpful about calcs. So, keep up the good work. Can anyone help me with negative exponential ? Everytime I try to do calculations involving negative power of any number such as 10^-34, 5^-9 etc the calculator displays "syntax error". To enter negative numbers, press the (-) key, which is on the bottom row, just left to the ENTER key, not the subtraction key. You helped me a lot, because I had the same problem. My daughter just got a TI-36X Pro. Neither of us has used a scientific calculator and while everyone says its so simple to solve an equation, we are having a problem. I hit the 2nd key and num-solv and input the equation 3a-10=35. When I hit enter I get "Syntax Error" on the screen. Help!!! I am not sure, I was able to get the solver to work with the equation entered. We can try inserting a multiplication operator in between 3 and a: 3*a-10=35. I've uploaded videos on Statistics,Numerical Methods,Operation Research,Computer Science & Engineering(CSE),Number Systems,Android App Reviews,Travel & Food Videos and many other topics. And a series of videos showing how to use your scientific calculators Casio fx-991ES & fx-82MS to do maths easily. Click my YouTube channel's link below to watch them. I think the Ti-36x pro 1. because i have one and LOVE it 2. because it has more features that will be helpful/ necessary. As far as functionality goes, both calculators are great. I tend to favor the TI-36X Pro because the interface and integration of functions is better than the fx-991ES Plus. For example, the fx-991ES requires the user to go to a separate mode to use matrices and complex numbers while the TI-36X Pro does not. I think the interface of the TI-36X Pro is similar to the TI-83/84 Plus series (minus the graphing and programming). Agree? I had to replace mine last night - my old one got lost. I am mostly happy with the 36x with one exception. When getting square root answers it is possible to toggle between approx (decimal) and exact (square root) forms of the answer. However, the 36x does not seem to do this when doing any other roots - it only give approx answers (decimal). If anyone knows a way around this, I would appreciate it! I think this just a limitation of the TI-36X Pro (the conversion algorithm for other roots have not been programmed into the calculator). If we are looking for a calculator that has conversions to exact roots, we probably have to look at calculators with a CAS (Computer Algebra System). Thank you for your helpful review and your helpful replies to various inquiries. I am debating between buying the TI-36X Pro and the fx-115ES. While I am leaning toward buying the TI-36X Pro, I would like to ask one question before making a purchase regarding the comment I am replying to. You said the TI-36X Pro does not offer conversions to exact roots for roots other than square roots. Does the fx-115ES? Thank you in advance. No. Currently, I don't think there is any calculator that offers conversions to exact roots higher than the order 2. Does anybody know what capital letters A through F (2nd on 1 to 6 keys) are for? There's no mention of them in the user's guide. The letters A though F represent the numbers 10 through 15 in hexadecimal mode. I'm quite a fan of TI calculators and have a question regarding TI-36X Pro. If the battery (CR2032) was taken out from this calculator, will it still work properly if there was enough strong light shining on its solar panel??? 1) The polynomial equation solver for TI-68 can solve equations of degrees 2-4; the TI-36X pro only degrees 2-3. 2) The simultaneous equation solver for TI-68 can solve 2 - 5 equations, while the TI-36X pro only 2 - 3 equations of this type. 3) On the TI-68, there is a delta % function, where it works out the difference between two numbers in %. I don't think the TI-36X pro has one. Please answer me if the TI-36X pro can be powered up (without battery) by sunlight/strong indoor light, thanks. To be honest John, I don't know. One problem that we can run into if we tried to use the TI-36X Pro is that the battery allows for data to be stored in the calculator after the calculator is turned off. To contrast, the classical TI solar calculators (30-STAT+, 36X to name two) do not have battery back up. Each time the calculator was turned off or the calculator was removed from a light source, the entire contents of memory were cleared. Can someone help me with a doubt? I just bought a TI-36x pro and this is my first good scientific calculator and I'm learning how to use it. Why it does not calculate integrals like ∫(1-x)dx or ∫1/(1-x)dx (with appropriate upper and lower limits)? It should. The thing you need to watch for is does whether f(x) has a value (exists) for it's interval. If f(x) divides by zero, chances are the integral will not calculate. Make small adjustments to the limits (i.e. from 1 to .99999) and you should be OK. Awesome thread. Learned on a TI82/83 in high school. Can't use those on the FE/PE so i picked TI86-Pro. Love, love, love it. Advice to potential engineers: buy and use the calculator you are more familiar with. you have enough to learn and you dont need to complicate it with trying to learn how a new calculator works. If you aren't familiar with ANY of them, then it doesn't matter what you pick. For what it's worth, ppi2pass likes the casio FX 115ES. I'm more comfortable with TI so that's what i used. It is important to notice, that in Europe TI 36X Pro is still being sold as TI 30X Pro and Yes it's updated bug free version. Been playing with stored operations. Does anyone know how to punch a variable and then have an operation such as sin or e^ being performed ? Good question Mark. I don't think the way stored operations are set up, we could use operations on sin(x) or e^(x). The closest thing I can think of, is to use a stored operation as a formula in x or a. Store the argument in x and run the op as such: 1 [op]. It is interpreted as 1 * [ f(x) ]. I tested this on a TI-34II but I would imagine the TI-36X Pro would handle this just fine. Would you choose this or the Canon F-792SGA? Mainly used for university calculus. Yes - it is a calculator worth checking out. Just wondering if there is a way to explicitly input something that would work as infinity within an integral on the 36X pro. I notice when attempting to calculate the integral from 0 to infinity of something like e^(-x), the calculator starts giving incorrect results when you increase the upper integral bound above 3563 (result should be 1 but at upper bound of 3564, but instead we see .000009968). Great calculator though, I use it over my TI-89 all the time because they really did a good job making the things that are useful very accessible. Personally, I would choose the Canon over the TI because of the CODATA 2010 physical constants, the more extensive conversions, the ability to handle 4x4 matrices, and the ability to solve 4th order equations. You stated in the review that the calculator has the ability to solve infinite solution and no solution equations using Numeric solver. Could you please let me know how to do that? I either get 0 for an answer or a very long non-terminating decimal. Thank you.